* "Sakawa" is the name, given locally, to fraudsters. Ghana has become the HOT SPOT for internet scams. The "share of scammers: About 50% are Nigerians, and about 50% Ghanaians. (as English speaking). Not counted scams, carried out via the French language. As English is widely spoken, worldwide, the majority of the scams is "English". There are scams in German as well. Mainly dating and Gold Scams. 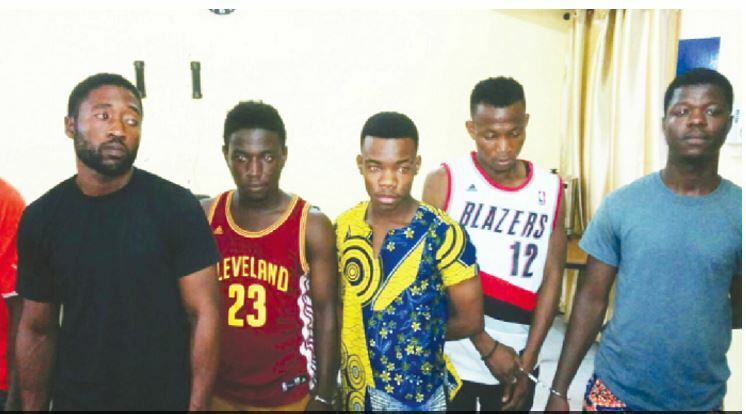 Ten people suspected to be involved in cyber fraud, popularly known as ‘Sakawa’, have been arrested at Alhaji Tabora, near Lapaz, in the Accra metropolis. The suspects, who use the Internet to obtain payments falsely through various types of electronic transactions are said to have operated in a rented house at Alhaji Tabora. The police gave their names as Issah Future, 27; Frederick Gyasi 23; Ditamel Boateng, 21; Dominic Acquaye 28 and Obed Sam, 21. The rest are Danlad Saed, 24; Hudson Ansah, 21, Nhyiraba Kwabena, 23, and Richmond Agbozo 28. They are said to have defrauded their victims, who are mostly foreigners, of unspecified amounts of money. Briefing journalists in Accra, the Director of the Criminal Investigations Department (CID) of the Ghana Police Service, Chief Superintendent of Police Mr Herbert Gustav Yankson, said the suspects were nabbed following police intelligence on the activities of young men engaged in the criminal activity of obtaining electronic payments falsely. The activities of the young men, he said, were contrary to Section 119 of the Electronic Transaction Act. He said the police, after conducting a search of the house where the suspects were arrested, retrieved eight laptops, an HP system unit and 15 mobile phones believed to be the gadgets used by the suspects to aid their illegal transactions. Preliminary investigations conducted following the arrest of the suspects, Mr Gustav said, indicated that they used the money they obtained illegally to buy electronic gadgets, including 50-inch flat-screen television sets, laptops, tablets and mobile phones. He said the police had observed a recent trend in the country where masterminds of cyber fraud recruited young men who had skills and knowledge in information technology (IT) for such activities. When the young IT-inclined men succeeded with their cyber activities, Mr Gustav said, the booty was shared with their paymasters. He said the Cyber Crime Unit had received numerous complaints from Interpol about cyber fraud activities from Ghana in recent times. To curb the activities of cyber crimes, he said, the Cyber Crime Unit was embarking on an operation to clamp down on cyber criminals. He advised the public to exercise due diligence when transacting any form of business on the Internet and urged the youth to desist from cyber crimes. The maximum punishment for any culprit, he said, could be a jail term of 10 years if found guilty. * If you think, that you might be in contact with scammers, please get back to us!